Spaghetti Pie Kids Cooking Party. 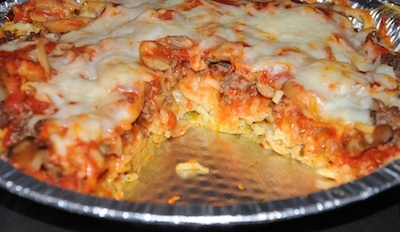 For this Spaghetti Pie kids cooking party, you will want to write down the recipe below. Create one for each child that will be at the party. This will give them each a chance to follow the recipe while they are preparing the menu. It is also a good idea to include an extra one for them to take home, one that won't get cheese or spaghetti sauce on it. They can impress their own family with what they learned at the cooking party. Once you know the number of children coming go through the list of things needed especially utensils, bowls, etc. If you need extra for the spaghetti pie kids cooking party ask friends or family if you can borrow some items. 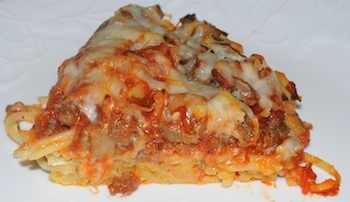 Spaghetti Pie is an easy fun recipe for kids. Small individual pie pans. This will allow each child to prepare their own pan. If not available use muffin pans. Bowl- 1 or 2 large depending if you are doubling the recipe-for mixing noodles. Cook hamburger morning of party or night before just make sure you drain grease off well. Cook noodles before hand so they will be ready when the party starts. Have one child add melted butter and one child add eggs to the noodles. Have another child stir and toss until well mixed. Give each child an individual pie pan. ** With cooking spray have each child spray baking pan. Each child can add noodles to the bottom of their pie pan. Spread spaghetti sauce over noodles. Season with oregano or Italian seasoning. Layer the ingredients on top of the spaghetti sauce starting with Parmesan cheese. Spread cottage cheese over top. Sprinkle with cooked hamburger, shredded mozzarella cheese and top with spaghetti sauce again. Have each child put their name on their pan with masking tape. Bake at 350 degrees for 25 minutes. While the spaghetti pie is cooking, prepare a dessert or other recipe you have planned, decorate aprons, chef hats or play cooking games. Cook spaghetti pies in individual pie pans, if not available cook in muffin pans. Label each child's with masking tape along the edges. Allow them to make 2-3. You can also buy small aluminum pans for them to take home extras.